So I dug up an old GameCube for the sole purpose of playing Metroid Prime. Really, it’s the only game I have for it. I have the component cables plugged into my Yamaha a870 receiver and get the “Display in Progressive Scan Mode?” option at the title screen. I have video when I choose NO but no video when I choose YES. I’ve tried changing the video modes on the a870 between DIRECT and PROCESSING settings. It’s clearly not a Component-to-HDMI issue because I DO get video. Am i missing a setting? I can play it with Progressive Scan turned off. Just curious. Can you try plugging it directly into a TV and see what happens? Would be a hassle but i guess on my kids tv. You think it could be the component cable or gamecube itself having issues with progressive scan mode? Process of elimination more than anything. If it works than you can rule both of those out and concentrate your efforts on troubleshooting the receiver. The alternative is you spend all of your time fussing around receiver settings only to find out it is one of those two things. Good point. WIll give it a go once i return from picking up my granddaughter. When you switch to progressive mode in the game, does the HDMI indicator on the receiver go out? 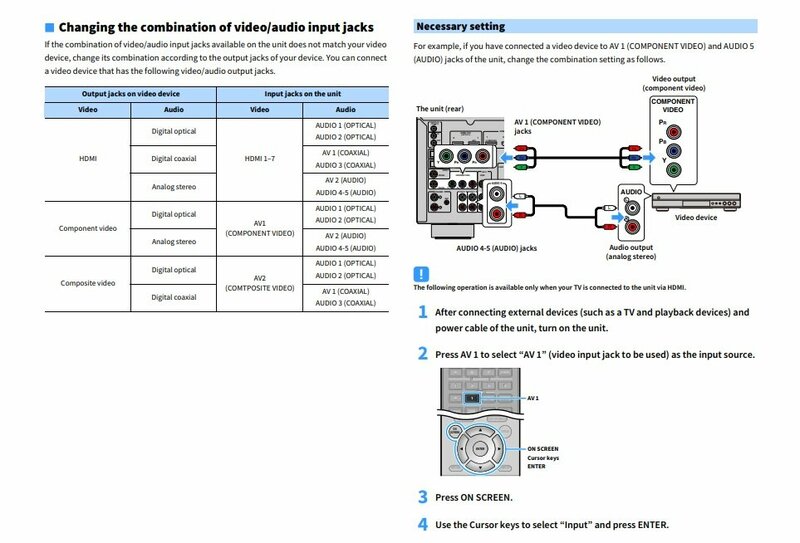 The Yamaha should show an HDMI indicator for either HDMI 1 or 2 being enabled and outputting a signal (its a red indicator according to the manual). Curious if it just completely goes out at that point. Do you still get audio is another question? I would imagine you do since the audio is independent of the video in a component setup. Romier, the red HDMI indicator only goes out for a fraction of a second as if the input source is changing but immediately returns and stays on. Yes, I still get audio. My setup is GameCube component cable going into AV1 on receiver, composite cable (red/white only) going into Audio4. Video (yellow) cable is not connected. You also might want to find another component source and see how the receiver responds. Yep and if that doesn’t work and you’ve tested to make sure the GC and cables are good, let FaceTime and I’ll help troubleshoot the receiver settings if you get time open. Thanks guys. After granddaughter, rest of family came over so didn’t have time to delve too much into it but will tomorrow. Appreciate the help.